A Guide To Authenticating Designer Clothing, Shoes, & Accessories Online. Coats, Jackets, and Suits have this larger silver logo tag sewn inside the chest just below the inner pocket (if there is a pocket). The earlier Dior Homme collections (like Luster) had embossed Dior logo tags. Later they changed them to stitched embroidery. Above are two authentic examples of these tags. The one on the left is embroidered and the one on the right is the older embossed version. The suit coat tags are approximately 2.5 inches wide by 1 inch tall. The tags that are sewn into outerwear (ie. overcoats, jackets, etc.) are approximately 3 inches long by 1.5 inches tall. The embroidered "D" is 5/16 of an inch tall. The embossed "D" is 1/4 on an inch tall. Above are two more authentic examples. The one on the left is from a wool overcoat. The one on the right is from a suit coat. Now we get to the fakes. 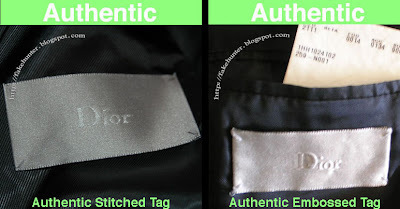 The key to distinguishing these fake tags is in the proportions. The lettering of the fake tags is often larger than the authentic tags. The fake "D" is also usually more elongated. The authentic tags are stitched with a stitch in each corner, which is often omitted on the fakes. However, as you can see above there are some pretty good fake tags out there. The differences here are subtle but still present. You can still see the elongated "D" and the material of the tag is different. The authentic tags are printed on a very smooth silver material with very little texture. Although it is not part of the tag, the other giveaway in the fake shot is the stitching in the upper right and left of the photo. It is very cheaply done and not even. If you are looking at an online auction for a Dior Homme item and there are no pictures of the tags or labels, request them. They are one of the surest ways to identify the authenticity. If the pictures are provided in the auction compare them to the real labels. Remember to keep an eye on those "D"s.
The written content and original images on this site are © 2008, Fake Huneter. All other images are © their respective owners. No material from this site is to be used without expressed written consent.